Boris Karloff stars as Im-ho-tep/Ardeth Bey, a resurrected 3000 year old Egyptian mummy in search of his re-incarnated princess. DM plays Frank Whemple, a British archaeologist who falls in love with the same girl thereby invoking the Mummy's wrath. Professor Muller, noted Egyptologist, comes to Frank's aid, and even saves his life. Eventually Karloff is only destroyed through intervention from Thoth himself in an exciting finish! The Mummy presents Boris Karloff in his first all-speaking Universal horror role (after Frankenstein and The Old Dark House.) Essentially a re-working of Dracula, The Mummy is directed by Karl Freund, a German émigré, and Dracula's cinematographer. Visually impressive and fluid The Mummy is fun to watch and Karloff has some of his greatest moments. 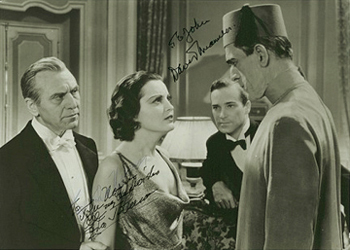 A definite favorite and a solid DM performance, The Mummy is also notable for its unusual leading lady, Zita Johann. Purchase The Mummy in VHS or DVD format through these Amazon.com links and a portion of the sale goes to the David Manners web site. Help support this site with your purchase.